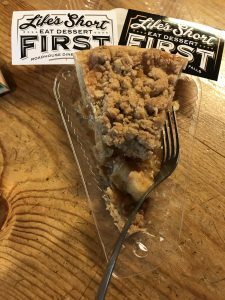 Here’s the beginning of the story – I simply HAD to eat one more piece of pie to keep my record of “verifying” every pie location on Central Montana’s pie trail, Pie a la Road. There was no long road trip for this one. In fact, I could have (should have) walked to Roadhouse Diner in Great Falls. 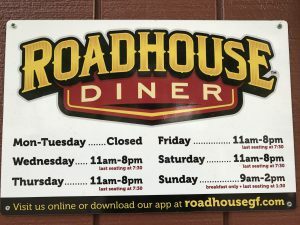 Roadhouse Diner is known for several things – their amazing and unique burgers, delicious fries, large portions, fun location. You get a lot of food in that burger but the novelty is really the combinations and names of the burgers. I’ve never had red hots on a burger before, nor peanut butter and jelly on a burger…and the list could go on with unique burger toppings. Part of the menu changes with limited offerings of specialty burgers and it’s fun just to see the names and toppings they come up with. Let’s get back to pie though. 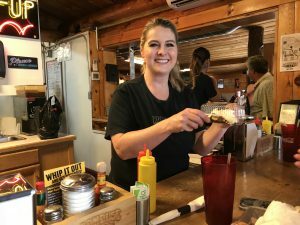 I had three choices the day I was at Roadhouse Diner – coconut cream (and I love coconut cream pie), caramel apple and the Elvis (a lemon filling with a layer of chocolate under that). I hesitated between caramel apple and coconut cream but that dilemma would be solved later. My first bite was heavenly and it just kept getting better! Lots of apples, a super chunky crumb topping and caramel throughout, not just a little drizzle on top. Each of those three items exceeded any expectation I had. And the crust was delicious. I asked Tara, the owner, what type of shortening was used in her crusts. That is a multiple answer question because of the variety of pies – some butter, some shortening, some crushed cookies. Tara rose to the challenge on that comment and, after giving the customer what she ordered (the Elvis), she then produced a piece of coconut cream, on the house, to prove that it was excellent. My counter-mate had half of that piece and Tara set the other half in front of me. Of course, I had to eat that. I loved the coconut cream pie too. It was fluffy with a whipped cream topping and good flavor. But I couldn’t figure out the different flavor I was getting in each bite. Finally Tara said, the crust is made with Nilla wafers. Then I realized I was also enjoying a sweet vanilla flavor along with the coconut. I was almost done with my half piece of coconut cream pie when the gal next to me (who hated coconut) responded to Tara and said, “It’s actually really good!” I agreed. Roadhouse Diner is in a log building, not huge, with tables and counter seating. In their first two years they’ve acquired quite a following. Tara was selected (and WON) Food Network’s Guy’s Grocery Games which is a pretty darn nice kudo to have for your business. 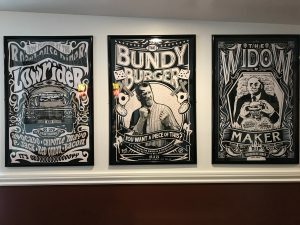 Jason Beam is a talented graphic designer and the posters he has done for the different burgers bear testament to that. As I left Roadhouse Diner and walked to my car I thought about my pie tasting. Yes, the pie was delicious and I’ll order it again, but what stuck in my mind was Tara. I didn’t meet her husband Jason, but Tara has what I term a “million dollar smile” and she used that smile on every customer I saw her interact with. Quite frankly, a piece of pie makes me happy but Tara sealed the deal with her genuine happiness. I was having a good day to start with and it only got better. Website design and hosting by Tempest Technologies, LLC.